With the title of "duchess" attached to her name, Kate Middleton is also the wife of the future King of England and the mother of the future king. But more often than not, the Duchess of Cambridge is faced with normal mom duties, including uniform shopping! In preparation for Prince George's first day of school on September 6th, Kate paid a visit to the store Peter Jones, which is part of the John Lewis department stores in London, with her two eldest kids in tow. The store stocks the 5-year-old's uniform for St. Thomas's Battersea, which requires its students to wear navy shorts, a blue button down and a navy sweater with the school's red logo during the warmer months. According to reports, Duchess Kate was shopping around for new shoes for Prince George when she made a very relatable parenting mistake -- she forgot socks! As the children were wearing summer sandals, the duchess was forced to borrow socks from the department store so her kids could try on their new shoes. In addition to their normal carpool duties, it's been reported that both the Duke and Duchess of Cambridge will be at Princess Charlotte's nursery school and Prince George's day school for the first day to help their children get settled. 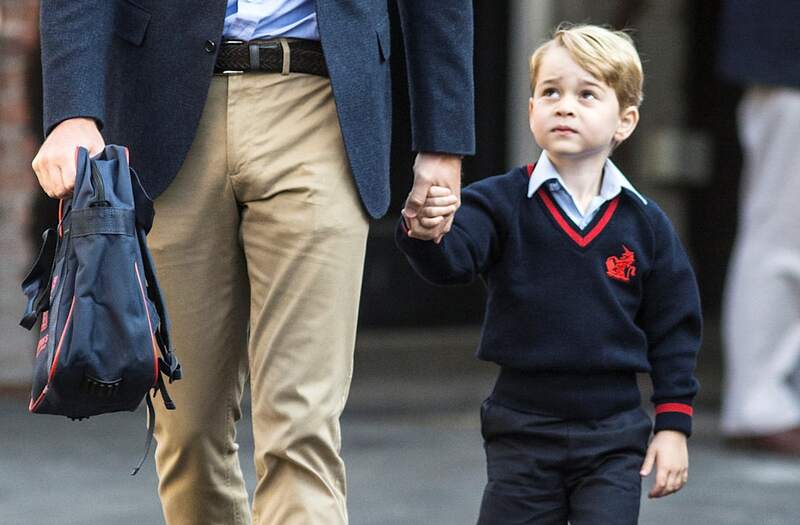 Last year, Kate was unable to see George off for his first day because she was suffering from a severe case of morning sickness due to her pregnancy with Prince Louis. Kate, she's just like us!